First off, forget everything you think you know about concert bands. They are definitely NOT just Sousa marches anymore! Case in point: the Penticton Concert Band. 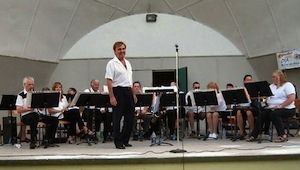 The Penticton Concert Band, under the direction of Gerald Nadeau, will open Music in the Park with some fantastic tunes on Thursday June 26. Catch the show a little later than the usual time. The band is set to start between 6:45 and 7, and will play through for about 90 minutes of great music. (All other Music in the Park concerts will run 6:30 – 8:00 p.m.). Come to the Oliver Community Stage (band shell), 6359 Park Drive. The band has been working hard on new repertoire which is sure to please. The audience will enjoy a variety of styles and tunes, including Irish music from Lord of the Dance, the Gladiator movie soundtrack, classic rock (The Beatles, Queen), and even some disco! Get ready to dance the night away, folks! Bring a lawn chair or blanket to sit on. Admission is by donation (suggested minimum $5 per adult), collected during the concert. Don’t forget to come early for the lively retail market and food vendors, 4:30 – 8:30 Thursday evenings in Oliver Community Park from June 19 to August 21. The Band is grateful for the ongoing support of sponsors, donors, arts organizations, and local media whose make it possible to continue to offer concerts. Sponsors are listed on the band’s website at www.pentictonconcertband.ca Dedicated band members come to practice in Penticton regularly from all around the Okanagan and Similkameen. The Band is always interested in auditioning new members who can play at an intermediate to advanced level. If interested, you can contact the band via the website on the “Contact” page, or call Gerald Nadeau at 250-809-2087.